I am a huge Pulp fan, but I don’t own many of their pre-His & Hers albums. Oddly enough, they tend to be really pricey, even used, maybe because of their rarity in this country. Countdown is a collection of the best songs from those years. 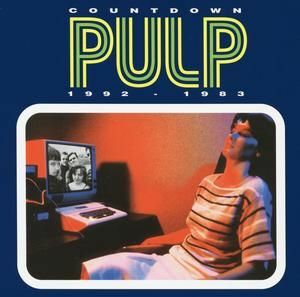 Pulp used to be a lot weirder in the earlier years, believe it or not, and Jarvis Cocker also sang in a lower register. Some of the much older songs are very creepy and almost gothic in nature and subject matter – dogs, stalkers, the mark of the devil, suffocation…the seeds of the later classic Pulp storytelling prowess and ironic humor are there, but they haven’t come together quite like the more modern albums yet. I do love a lot of these songs though, especially the simpler romantic ones like My Lighthouse, Don’t You Know, and Wishful Thinking. This album never ceases to get me singing along.